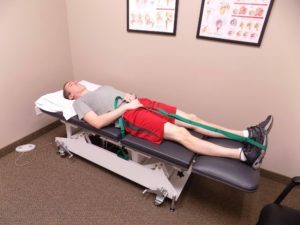 Muscles in the body that become too tight can cause a lot of pain! 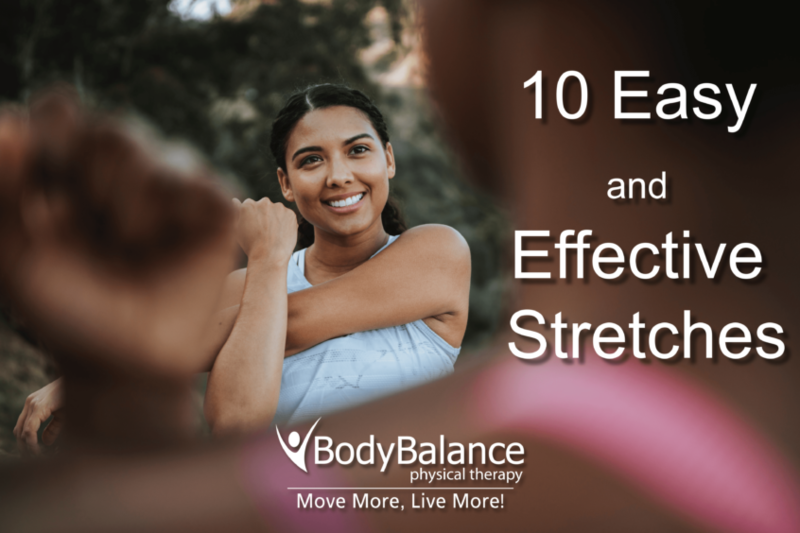 Sometimes a simple stretch can do the trick to give those muscles a good stretch and help them relax. Check out these stretches for muscles all over the body that are easy to do and can help alleviate your pain! The piriformis muscle is a deep back of the hip muscle that is easily overworked, resulting in tightening and spasms. 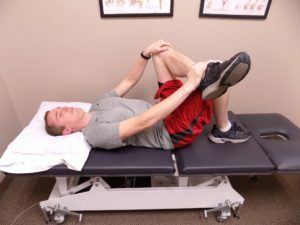 Stretching this muscle is beneficial for many people suffering from back, hip, and sciatic nerve pain. Begin by lying on your back on a flat surface, then place both feet flat on the floor with both knees bent. Rest the ankle of the right leg over the knee of the left leg. 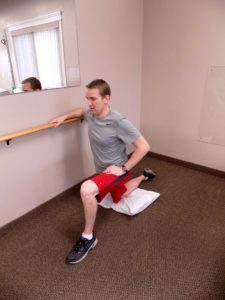 Pull the left thigh and ankle toward the chest and hold the stretch for 30 seconds. Repeat for each side 3-5 times. 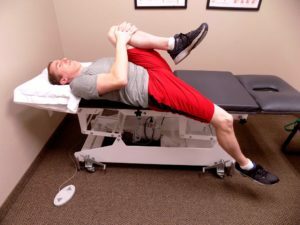 The hamstrings (the large muscle along the back of each thigh) and the sciatic nerve (nerve that runs down the back of the leg to the knee) are often tight and can contribute to pain that radiates down the leg from the back. This is a gentle stretch for muscles and a good nerve glide. Lie on your back with both legs straight. 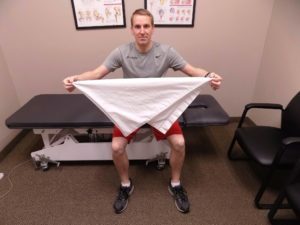 Pull one leg up and straighten by holding on to a towel or strap that is wrapped behind the foot until a mild stretch along the back of the thigh is felt. Hold 2-3 seconds, and then relax. Perform 10-15 repetitions. 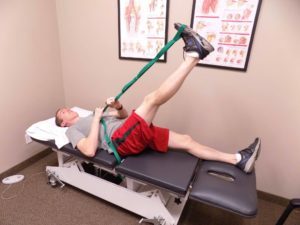 If a straight leg is too uncomfortable, modify by bending the leg and then stretching. Repeat this stretching process with the other leg. 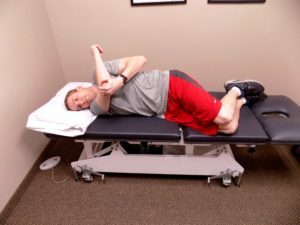 This is a useful stretch for the muscles through the low back and hip. It is most often helpful for those who have low back pain when standing and walking. 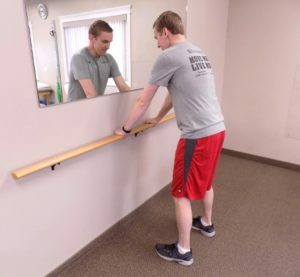 Start by gripping a stable railing or the kitchen sink. With your knees slightly bent, lean your hips back until you feel a gentle stretch in the back and hips. Hold for 5 seconds and repeat 10-15 times. The levator scapulae muscle is the muscle that runs down the side of the neck and into the shoulder, and is often tight and painful with neck pain. 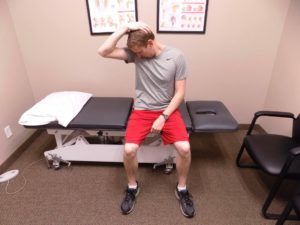 To stretch this muscle, raise your right arm forwards and reach over your back with the hand grasping the back of your head and applying downward pressure. While keeping everything else still, rotate your head to the right about 45 degrees and tilt the chin downward until a good stretch is felt. Hold for 30 seconds, and then repeat with left arm turning head to the left. Perform 3 repetitions to each side. 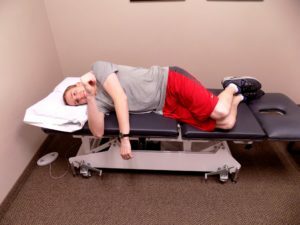 This stretch is designed to help loosen up the joints in your neck and relieve pain. 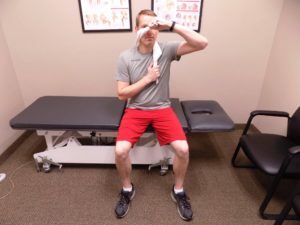 Roll up a towel and place it against your neck. Let go of the pillowcase, cross your arms, and then grab the ends of the pillowcase again. The bottom hand is the anchor that stays still. With your top arm, pull the pillowcase across the cheek bone while rotating your head. Hold for 3-5 seconds and repeat 10-15 times in one direction. Then switch hand position and repeat to the other side. This stretch is designed to stretch the mid back, also known as the thoracic spine, and relieve back and neck pain. 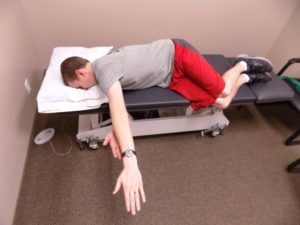 Lie on your side with the top hip 45 degrees and arms outstretched. Push your top arm out and then pull back to the shoulder as if you are drawing back an arrow. Exhale and try and get your shoulder to touch the floor or bed. Hold 2-3 seconds and perform 10-15 times, before rolling to your other side to repeat. 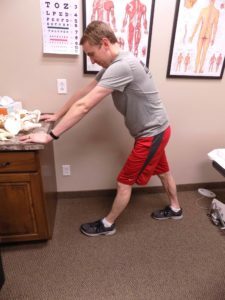 Stretching the back of the lower leg is an easy stretch that can help to relieve ankle, heel, and knee pain. 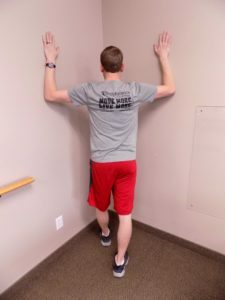 To begin, stand facing a couple of feet away from a wall or table, and place your hands on the surface for support. Step one foot back into a mini lunge, bending your front leg and keeping your back leg straight with the heel on the floor. Lean your hips forward while keeping the back heel flat on the ground. The further apart your feet are, the deeper the stretch will be. Hold for 30 seconds and perform 3-5 repetitions. Repeat on the other side. 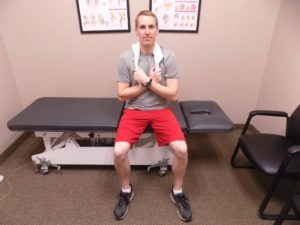 This stretch is for the pectoralis muscles of the chest, and will help relieve neck, mid back, and shoulder pain, as well as improve your posture. 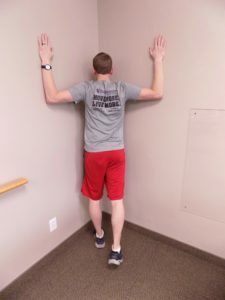 Stand facing a corner and place your forearms and palms on either wall at approximately shoulder level. 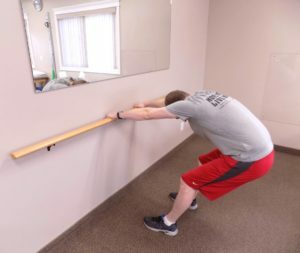 Exhale and lean towards the wall to feel a good stretch, but not as far as to cause discomfort. Hold this position for 30 seconds, and then relax. Repeat 3-5 times. 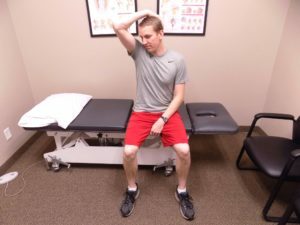 This stretch is designed to stretch the muscles in the back of the shoulder and can be used to help relieve shoulder pain. Lie down on your side, making sure you are lying mostly on your shoulder blade and not directly on your shoulder. Cross your top arm over your chest and hook it around your lower arm. With the top arm, pull your lower arm across your body at chest level. Hold for 30 seconds and do 3-5 repetitions. Switch to lying on your other side, then repeat. 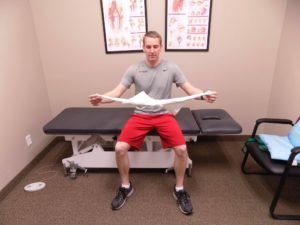 There are two common variations of this stretch, which is designed to stretch the muscles in the front of your hip that attach to the spine. 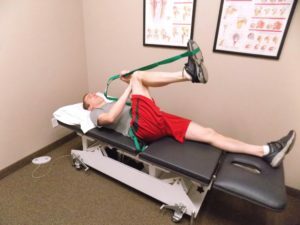 This stretch is particularly useful for relieving hip and low back pain. Kneeling Variation: Kneel with your right knee on the floor and your left leg at a 90-degree angle in front of you. Put your hands on your left leg and keep your back straight. 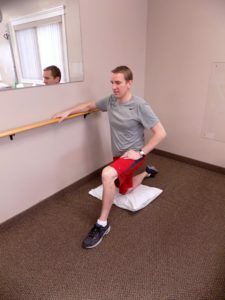 While keeping your right knee pressed to the floor, drive your right hip forward by squeezing the muscles in your right buttocks. 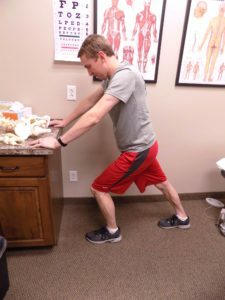 The stretch should be felt in the front of the right hip and thigh. Hold for 30 seconds and perform 3-5 repetitions, then repeat on the other side. 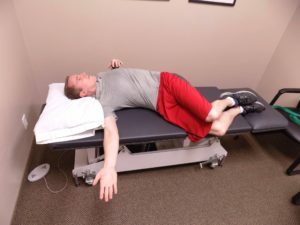 Horizontal Variation: Lie on your back on a bed or raised surface with your right leg hanging off the edge. Keep this hanging leg straight and relaxed. Pull your left knee toward your chest to stretch. 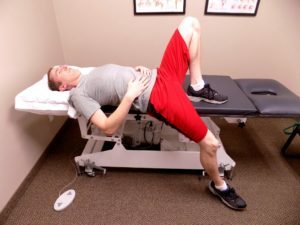 The stretch should be felt in the front of the hip and thigh on the right. Hold for 30 seconds and perform 3-5 repetitions. 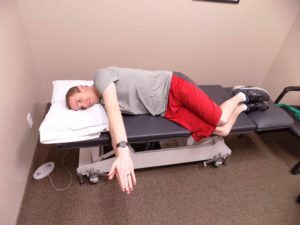 To repeat, adjust your position to have your left leg hanging off the bed before stretching.